I so get you! People think I’m extroverted, but it is really a hard thing to love others well when you’re an introvert and I am. This is both beautiful and raw. Thank you for sharing, Kristin! Deb YES!! And don’t you often think that people assume we are extroverted when we write…but I am SO NOT! 🙂 Glad to know you face the same struggles and we are not alone!! You are definitely not the only one, Kristin. Part of why I was so exhausted last week (first week of school) was because of all the energy I had to expel meeting new parents! The bus stop in the morning is still a tad awkward and small talk at the orientations was not my favorite, but I’m praying it will get better. 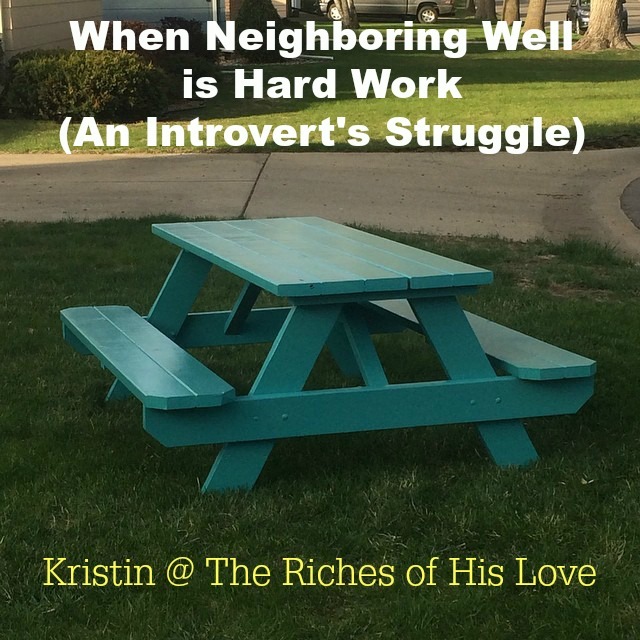 Don’t beat yourself up too much for being an introvert because it’s how God made you, but I will pray that you will find ways to be a good neighbor in the midst of it. Hang in there – I’m right there with you!